PATHFINDERLED ULTRA MINI COMPACT H4 LED BULB W/ADJUSTABLE BASE FOR HARLEY AND OTHER MOTORCYCLES - PLUG N PLAY. SoCalMotoGear.com - Professional Grade Motorcycle Lighting - Plug N Play Products - "Riding at night has never been brighter!" Introducing the new Ultra compact H4 mini LED bulb. 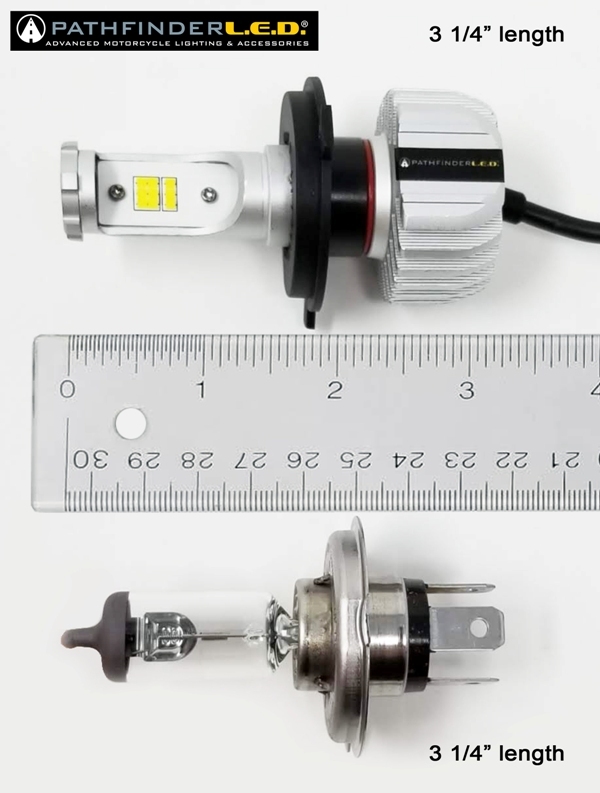 This bulb can replace your stock halogen H4 bulb and is used in many applications ranging from motorcycles, vehicles and off road terrain vehicles. The design features a solid state non moving internal component design, no fan or drivers makes this an ideal bulb for rugged applications. Increase your visibility to other drivers/riders, lower the electric load on your alternator and battery. Increase the life span of your lights. LED lighting makes you stand out and see better than ever before. Installation is as easy as replacing your stock bulb. Same length/footprint as standard H4 stock incandescent bulb. Adjustable base that adapts to different headlight housings to achieve optimal beam pattern. H4 removable base - Plug N Play installation. Rugged solid state design - Non moving parts. PATHFINDERLEDs are warranted against defects for a period of 1 year unlike 60 days from other outlets, satisfaction guaranteed. Always verify your bulb type before ordering.